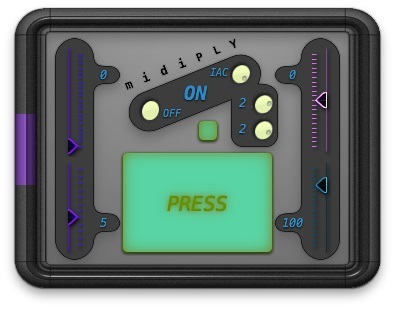 midiPLY modifies MIDI in real-time, it multiplies incoming MIDI notes and overrides tracks that are synced. With this app you can find undiscovered sounds by using it on combinations of midi tracks and sounds. midiPlY is ideal for use with drums and percussion tracks. Launch midiPLY, set BPM (default = 120) and click on the “PRESS” or hit Space Bar to activate. Press [H] for hints to use each controls. This app is meant for real-time modification of a ready made midi track. You can also use it to go outside your usual melody lines.